Vitamin A is a dietary molecule of 286 Da size, discovered before a century, and it is important for vertebrate embryogenesis, normal development, and growth. It is a fat-soluble vitamin and vertebrates are unable to synthesize it. Normally, it is acquired from plants (provitamin A) and animal (preformed) food. The studies in the last years showed that retinoic acid (RA), which is the most potent metabolite of vitamin A, has a direct effect on stem cell biology, and a direct effect on mitochondrial function. Okada (2004) showed that RA is one of the important morphogens in neuronal differentiation of the central nervous system (CNS) development. RA has a crucial role in the process of anteroposterior axis specification and dorsoventral patterning of the spinal cord. Neuralization and positional specification of the developing CNS are depending on concentration gradient of RA. In the intrauterine life of vertebrates, the embryonic level of RA should be controlled tightly, as congenital anomalies in many organs may develop from excessive as well as reduced embryonic level of RA. Many studies pointed out that excessive RA intake during pregnancy leads to neural tube defect,, additionally, RA exposure during intrauterine life inhibit the migration of neural crest cells and alter their migratory patterning. Williams et al. and Luijten et al. showed that overexposure to RA leads to changes in the expression of many genes that are involved in developmental signaling pathway, like those genes involved in mitochondrial function (Timm8a and Timm8b) and genes involved in cell signaling (Stmn2 and Sema4b). Daily administration of <10,000 IU of preformed vitamin A to pregnant ladies is not teratogenic and safe. However, epidemiological studies on humans do not show at which dose the RA become teratogenic. Over access to RA by supplement of fortified food or supplement of RA to avoid Vitamin A deficiency is an important strategy, however, it is essential to monitor the effect of this practice on health because it might lead to a health hazard. In addition to that, RA can be used in the treatment of several dermatological diseases, immunodeficiency, and leukemias. In vivo tests still are the best in predicting the neurotoxicity of any compound, but this need large number of laboratory animals which can face ethical, economic, and legislative concerns; therefore, the need to find, validate, and to apply certain alternative to in vivo toxicity tests becomes urgent. The recent tests for evaluating the effects of chemical compounds on the nervous system development relying mostly on cell lines derived from tumors and they are either from human or rodents. Therefore, these cells do not represent normal behavior of nerve cells. Therefore, to find an in vitro test with a high rate in predicting toxicity, a test should have the most important events in the development of central nervous tissue, such as cellular proliferation, differentiation, and cellular migration. However, neural stem cells from human have been proposed because they are able to proliferate, migrate, and differentiate into different cells in the nervous system. Furthermore, as these cells derived from human, the need to extrapolate these result is less since species differences are circumvented. 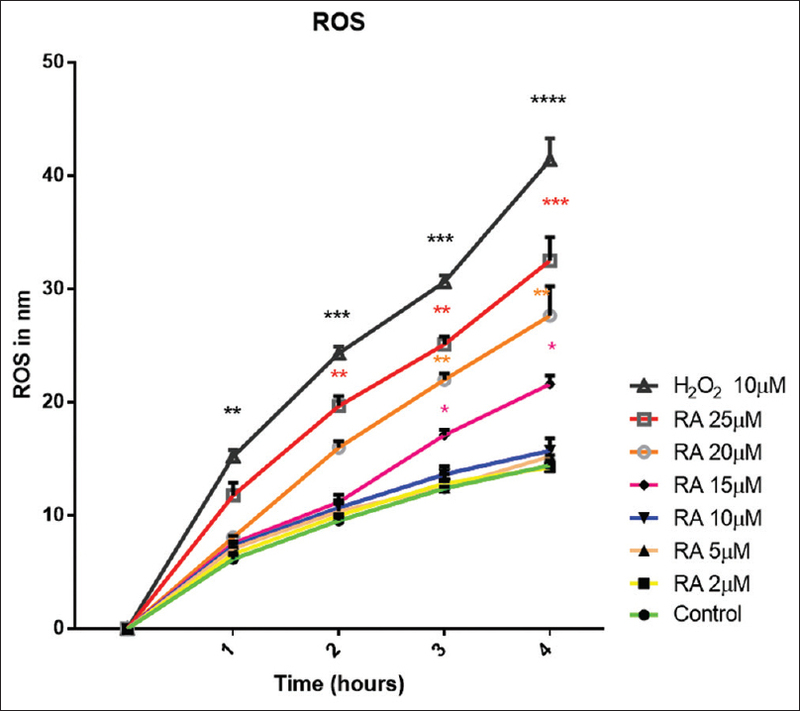 Reactive oxygen species (ROS) are by-product of aerobic metabolism, ROS accumulation results in oxidative stress which implicated in several diseases. The assay uses nonfluorescent probe 2', 7' dichlorofluorescein diacetate (DCFH-DA) which passively enter the cells; then, inside the cell, cleavage of diacetate group occurs by the action of cellular esterase enzyme. The DCFH is oxidized by ROS in the cells to dichlorofluorescein (DCF) which is fluorescent. The amount of fluorescence produced is directly proportional to ROS level in the cells. H2O2 was employed also as a positive control in a dose of 10 μM because it is the main ROS which cause cellular oxidative stress. The brain tissues from aborted fetuses (<12 weeks of gestation) were obtained as a grant from “Joint Medical Research Council/Wellcome Trust, grant #099175/Z/12/Z, Ethic committee approval 08/H0906/21 + 5, Health Research Authority NRES Committee North East-Newcastle.” The brains were dissociated into single-cell suspension according to the Uchida protocol. 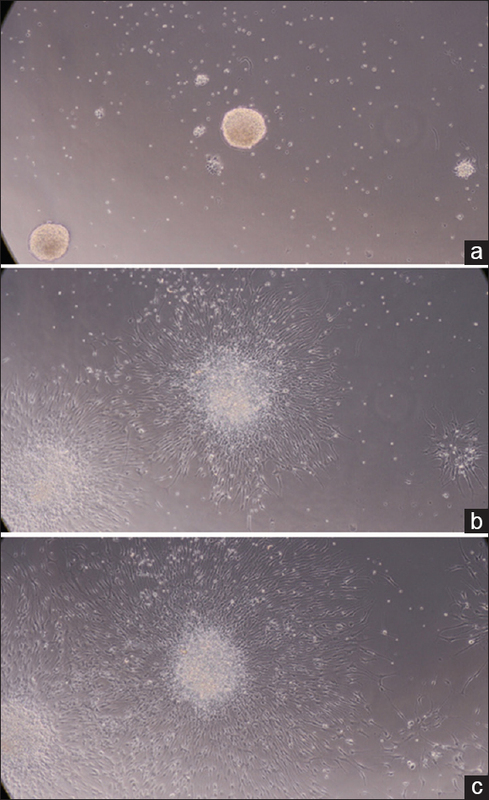 The cell suspension was cultured in stem cell maintenance media – serum free (1:1 Ham's nutrient F12 and Dulbecco's modified eagle's medium [DMEM]) from Sigma, 20 ng/ml epidermal growth factor (EGF), 10 ng/ml basic fibroblast growth factor (bFGF) from Gibco, 5 μg/ml heparin from Sigma, N2, B27 supplements from invitrogen, and 2 mM glutamine from Sigma) and kept in 25 cm2 uncoated flasks and left in the incubator with 5% CO2 at 37°C with humidity of 100%. The cells proliferate to form neurospheres in the media, when they become large, cell splitting was performed using accutase. For these two assays, 48 well plates were coated by poly-D-Lysine (PDL) at a concentration of 5 μg/cm2 and laminin at 2 μg/cm2. 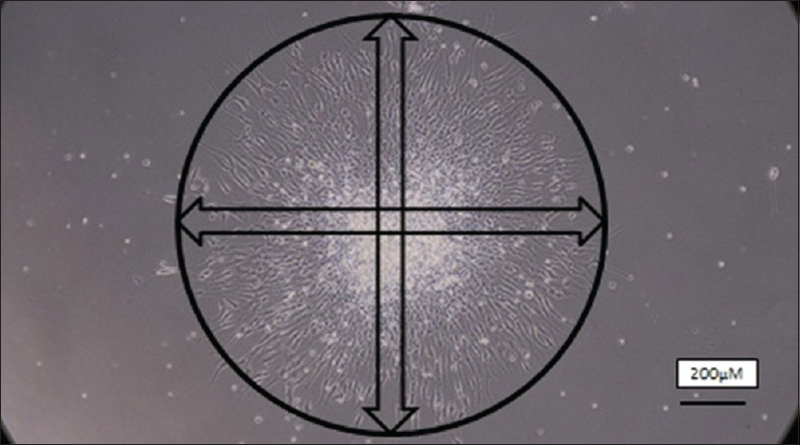 The neurospheres were split using accutase, after that, the cells were seeded into the wels of the coated plate (average 6 wells for each experiment) at 3 × 104 cells per each well to make cellular monolayer, 500 μl of the drug (RA), and stem cell differentiation medium (which is similar to stem cell maintenance media but without bFGF and EGF) were added in the wells for 6 days. The first column was left without drug as control group, [Figure 1]a. The media was changed after 3 days, [Figure 1]b. The passage number of the cells was 20–25. The cell viability (resazurin test) was done on the 6th day of the experiment and followed by kenacid blue assay (protein amount) using the protocol of Qureshi. In resazurin test, the nonfluorescent material (blue resazurin) is transferred into fluorescent (pink resorufin) by the action of active mitochondria of the live cells; therefore, the amount of fluorescence, which is measured by plate reader, is directly proportional to the number of live cells. The neural stem cells were cultured in 96-well plate (black walled), the assay was performed in the 6th day of the experiment. The media was aspirated, 100 μl of the drug and the dye was added to the seeded cells. The final concentration of the DCFH-DA was 20 μM. The fluorescence was measured at the time point 0, 1, 2, and 4 h by plate reader through setting the excitation filter at 485 nm and emission filter at 520 nm. The amount of DCF produced was determined in reference to the standard curve of 5 μM DCF. Eight well chamber slides were used for this test. The slides were coated by PDL and laminin. 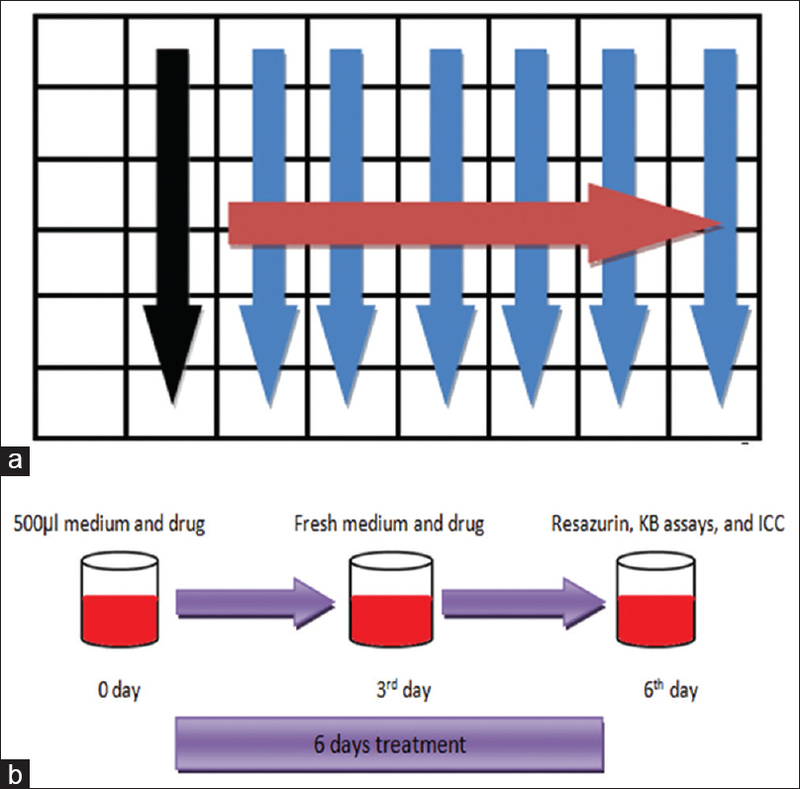 2 × 104 cells were seeded in each well, then 500 μl of stem cell differentiation media and different doses of RA were added for 6 days. The media was changed after 3 days of cell culture. The cells on the 6th day were fixed by paraformaldehyde (4%). Blocking and permeabilization was performed by bovine serum albumin (1%) and triton (0.25%) for half an hour. Two primary antibodies were added to do double staining, anti-tubulin III-mouse monoclonal/Abcam (ab78078) (1:500), and anti-glial fibrillary acidic protein-Rabbit polyclonal/Abcam (ab7260) (1:800). The incubation was at 4°C and for 24 h. In the next day, after washing the primary antibodies, the secondary antibodies were added (1:500) for 1 h. Then, 4′,6-diamidino-2-phenylindole (1:1000) was added followed by mounting with nonfluorescent mounting media. The 96-well plates (ultra-low attachment) were used. 1 × 104 cells/100 μl of stem cell maintenance media per well were seeded, plates centrifugation was at 300 relative centrifugal force for 3 min and placed in the incubator for 3 days to make single neurosphere, and then, RA was added with the media for 10 days, media changing was every 3 days, as shown in [Figure 3]. The neurosphere diameters were determined using microruler in an objective lens to measure the neurosphere sizes and compare the mean for an experimental group with the mean of the control group. Once the diameter of the neurospheres reached 350–400 μm, they were transferred into 48 well plates (uncoated) for 24 h to be grown in 500 μl of stem cell differentiation media and RA. Then, the neurospheres were transferred again into 48-well plates (coated by laminin and PDL). Normally, the neurospheres started migration after being attached to the base of the well in few hours. Photos at ×10 were captured at 0, 24, and 48 h after incubation. As illustrated in the [Figure 4], all migrated cells were encircled and outlined, two lines were drawn, one vertical to the other, and the mean of the measurement of these two lines was taken. The diameter of neurosphere was taken away, and then to get migration distance, the result was divided by two. The raw data were analyzed usingPrism software version 6 (GraphPad Software Inc., USA). The comparison between the mean of control group and the mean of experimental (treated group) was done by one-way ANOVA, but in case of cell migration, we used two-way ANOVA, then Dunnett's multiple test was performed to measure the significance of difference. Our study demonstrated that RA affects the viability of the cells and the total protein amount only at high doses (20 and 25 μM), as shown in [Figure 5]. It appears that the amount of resorufin and total protein were significantly reduced in comparison with control group P < 0.05. [Figure 6] shows that the neurite length was not significantly affected at the doses 2, 5, and 10 μM. However, it shows that RA causes a significant shortening in the length of neurite from 15 μM. In addition, in case of neurosphere size, at the doses 2 and 5 μM, there is a significant increase in the neurosphere size when compared with that of a control group, but at the doses of 15, 20, and 25 μM, there was significant reduction in neurosphere size in comparison with that of a control group. In case of ROS measurement, it appears that ROS significantly increased 3 h after the dose of 15 μM and appears to be significantly increased at earlier times in higher doses. ROS increased significantly 2 h after treatment with 20 μM RA and 1 h after treatment with 25 μM, as shown in [Figure 7]. 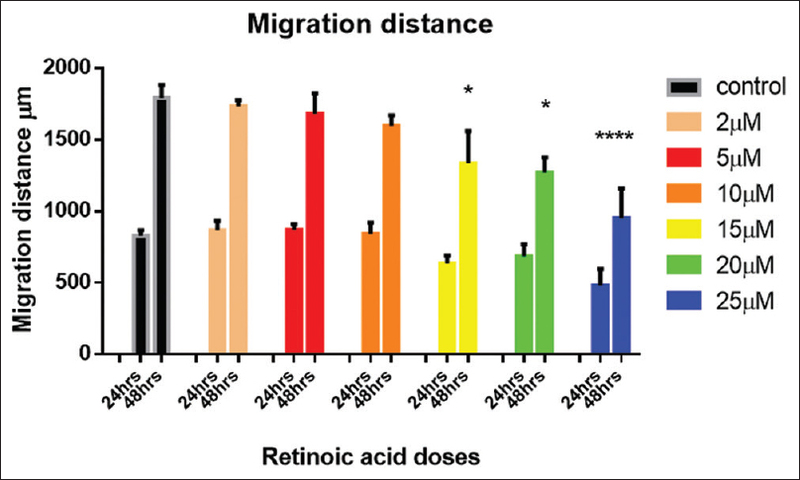 However, migration distance of the cultured cells was not affected significantly 24 h after incubation in all the doses, but the distance was reduced significantly 48 h after incubation from the dose of 15 μM and more, [Figure 8] and [Figure 9]. Vitamin A supplements to the rats cause mitochondrial dysfunction and increase the content of tissue necrosis factor-α. It seems that mitochondrial dysfunction represented by electron leakage, which leads to superoxide (O2-·) production and reduced the rate of adenosine triphosphate (ATP) production. Moreover, excessive RA supplementation alters the signaling pathways and triggers several neuronal dysfunctions which may be originated from pro-oxidative potential. RA in high doses increases the activity of glutathione (GSH) transferase enzyme, which consume a high amount of GSH. GSH is one of the important antioxidant compounds inside the cells and organelles, Thereby, RA supplementation alters the neuronal redox status not only by increasing the production of O2-· but also through the depletion of GSH. RA supplement in high doses ≥20 μM lead to cytochrome c release from the mitochondria by oxidation of cardiolipin and this trigger cell death by apoptosis and inhibit cell division which may explain the reduction in the sizes of neurospheres and reduction in the distance of migration. It has been shown that RA reduces the most important neurotrophic factor of the brain like BDNF, which control neural plasticity, mitochondrial biogenesis, and neuronal survival. Moreover, it has been demonstrated that RA causes cell differentiation, but recent studies pointed out that RA has a direct role in maintaining self-renewing properties and preventing cell differentiation in pluripotent stem cells.,, These studies showed that RA preserves cell stemness through activation of NANOG and OCT4, which are crucial transcription factors in maintaining the pluripotency of embryonic stem cells (ESCs). In addition, RA performed its function through stimulation of phosphatidylinositol 3 (PI3) kinase signaling pathway; therefore, treatment of ESCs with LY294002, a potent inhibitor of PI3 kinase pathway, enhances cell differentiation and prevent self-renewing by RA, this confirms the involvement of PI3 kinase in the mechanism of action of RA. It has been revealed that treatment of ESCs during early differentiation with RA for short duration stops further differentiation of the cells. Furthermore, they indicated that RA upregulates the expression of LIF, Wnt3a, Wnt5a, and Wnt6. Our results agree with the results of Rajala and Vaajasaari who demonstrated that low doses of RA (0.5 μM) have no effect on self-renewing capacity of ESCs, but the doses which located at and around the therapeutic level (2–5 μM) resulted in maintaining self-renewing ability of the cells as shown in the results by increasing the sizes of neurospheres. Rajala and Vaajasaari suggested that RA increases the expression of NANOG and OCT4 which are responsible for maintaining cellular stemness. It can be concluded that human neural stem cell culture has the potential to predict the neuroprotective and neurotoxic effects of retinoic acid. McCollum EV, Davis M. The necessity of certain lipids in the diet during growth. J Biol Chem 1913;15:167-75. Napoli JL. Physiological insights into all-trans-retinoic acid biosynthesis. Biochim Biophys Acta 2012;1821:152-67. Chen L, Khillan JS. A novel signaling by Vitamin A/retinol promotes self renewal of mouse embryonic stem cells by activating PI3K/Akt signaling pathway via insulin-like growth factor-1 receptor. Stem Cells 2010;28:57-63. Zhang S, Sun J, Pan S, Zhu H, Wang L, Hu Y, et al. Retinol (Vitamin A) maintains self-renewal of pluripotent male germline stem cells (mGSCs) from adult mouse testis. J Cell Biochem 2011;112:1009-21. Acin-Perez R, Hoyos B, Zhao F, Vinogradov V, Fischman DA, Harris RA, et al. Control of oxidative phosphorylation by Vitamin A illuminates a fundamental role in mitochondrial energy homoeostasis. FASEB J 2010;24:627-36. Zhao X and Duester G. Effect of retinoic acid signaling on Wnt/β-catenin and FGF signaling during body axis extension. Gene Expression Patterns 2009;9:430-5. Okada Y, Shimazaki T, Sobue G, Okano H. Retinoic-acid-concentration-dependent acquisition of neural cell identity during in vitro differentiation of mouse embryonic stem cells. Dev Biol 2004;275:124-42. D'Aniello E, Waxman JS. Input overload: Contributions of retinoic acid signaling feedback mechanisms to heart development and teratogenesis. Dev Dyn 2015;244:513-23. Cai W, Zhao H, Guo J, Li Y, Yuan Z, Wang W, et al. Retinoic acid-induced lumbosacral neural tube defects: Myeloschisis and hamartoma. Childs Nerv Syst 2007;23:549-54. Luijten M, van Beelen VA, Verhoef A, Renkens MF, van Herwijnen MH, Westerman A, et al. Transcriptomics analysis of retinoic acid embryotoxicity in rat postimplantation whole embryo culture. Reprod Toxicol 2010;30:333-40. Williams SS, Mear JP, Liang HC, Potter SS, Aronow BJ, Colbert MC, et al. Large-scale reprogramming of cranial neural crest gene expression by retinoic acid exposure. Physiol Genomics 2004;19:184-97. Pacifici GM. Effects of Vitamin A in neonates and young infants. Int J Pediatr 2016;4:1339-54. Ross DA. Recommendations for Vitamin A supplementation. J Nutr 2002;132:2902S-6S. Bailey J, Knight A, Balcombe J. The future of teratology research is in vitro. Biogenic Amines 2005;19:97-145. Breier JM, Gassmann K, Kayser R, Stegeman H, De Groot D, Fritsche E, et al. Neural progenitor cells as models for high-throughput screens of developmental neurotoxicity: State of the science. Neurotoxicol Teratol 2010;32:4-15. Coecke S, Goldberg AM, Allen S, Buzanska L, Calamandrei G, Crofton K, et al. Workgroup report: Incorporating in vitro alternative methods for developmental neurotoxicity into international hazard and risk assessment strategies. Environ Health Perspect 2007;115:924-31. Guo YL, Chakraborty S, Rajan SS, Wang R, Huang F. Effects of oxidative stress on mouse embryonic stem cell proliferation, apoptosis, senescence, and self-renewal. Stem Cells Dev 2010;19:1321-31. Lee MN, Lee SH, Lee MY, Kim YH, Park JH, Ryu JM, et al. Effect of dihydrotestosterone on mouse embryonic stem cells exposed to H2O2-induced oxidative stress. J Vet Sci 2008;9:247-56. Uchida N, Buck DW, He D, Reitsma MJ, Masek M, Phan TV, et al. Direct isolation of human central nervous system stem cells. Proc Natl Acad Sci U S A 2000;97:14720-5. Qureshi WM, Latif ML, Parker TL, Pratten MK. Lithium carbonate teratogenic effects in chick cardiomyocyte micromass system and mouse embryonic stem cell derived cardiomyocyte – possible protective role of myo-inositol. Reprod Toxicol 2014;46:106-14. Conte da Frota ML Jr., Gomes da Silva E, Behr GA, Roberto de Oliveira M, Dal-Pizzol F, Klamt F, et al. All-trans retinoic acid induces free radical generation and modulate antioxidant enzyme activities in rat sertoli cells. Mol Cell Biochem 2006;285:173-9.
de Oliveira MR, de Bittencourt Pasquali MA, Silvestrin RB, Mello E Souza T, Moreira JC. Vitamin A supplementation induces a prooxidative state in the striatum and impairs locomotory and exploratory activity of adult rats. Brain Res 2007;1169:112-9. De Oliveira MR, Moreira JC. Impaired redox state and respiratory chain enzyme activities in the cerebellum of Vitamin A-treated rats. Toxicology 2008;253:125-30.
de Oliveira MR, da Rocha RF, Pasquali MA, Moreira JC. The effects of Vitamin A supplementation for 3 months on adult rat nigrostriatal axis: Increased monoamine oxidase enzyme activity, mitochondrial redox dysfunction, increased β-amyloid (1-40) peptide and TNF-α contents, and susceptibility of mitochondria to an in vitro H2O2 challenge. Brain Res Bull 2012;87:432-44. Halliwell B. Oxidative stress and neurodegeneration: Where are we now? J Neurochem 2006;97:1634-58. Lane MA, Bailey SJ. Role of retinoid signalling in the adult brain. Prog Neurobiol 2005;75:275-93. Hüttemann M, Pecina P, Rainbolt M, Sanderson TH, Kagan VE, Samavati L, et al. The multiple functions of cytochrome c and their regulation in life and death decisions of the mammalian cell: From respiration to apoptosis. Mitochondrion 2011;11:369-81. Green DR, Galluzzi L, Kroemer G. Cell biology. Metabolic control of cell death. Science 2014;345:1250256. Crandall J, Sakai Y, Zhang J, Koul O, Mineur Y, Crusio WE, et al. 13-cis-retinoic acid suppresses hippocampal cell division and hippocampal-dependent learning in mice. Proc Natl Acad Sci U S A 2004;101:5111-6.
de Oliveira MR, da Rocha RF, Stertz L, Fries GR, de Oliveira DL, Kapczinski F, et al. Total and mitochondrial nitrosative stress, decreased brain-derived neurotrophic factor (BDNF) levels and glutamate uptake, and evidence of endoplasmic reticulum stress in the hippocampus of Vitamin A-treated rats. Neurochem Res 2011;36:506-17. Napoli JL. Retinoic acid biosynthesis and metabolism. FASEB J 1996;10:993-1001. Chen L, Yang M, Dawes J, Khillan JS. Suppression of ES cell differentiation by retinol (Vitamin A) via the overexpression of Nanog. Differentiation 2007;75:682-93. Boiani M, Schöler HR. Regulatory networks in embryo-derived pluripotent stem cells. Nat Rev Mol Cell Biol 2005;6:872-84. Wang R, Liang J, Yu HM, Liang H, Shi YJ, Yang HT, et al. Retinoic acid maintains self-renewal of murine embryonic stem cells via a feedback mechanism. Differentiation 2008;76:931-45. Rajala K, Vaajasaari H, Suuronen R, Hovatta O, Skottman H. Effects of the physiochemical culture environment on the stemness and pluripotency of human embryonic stem cells. Stem Cell Stud 2011;1:3.